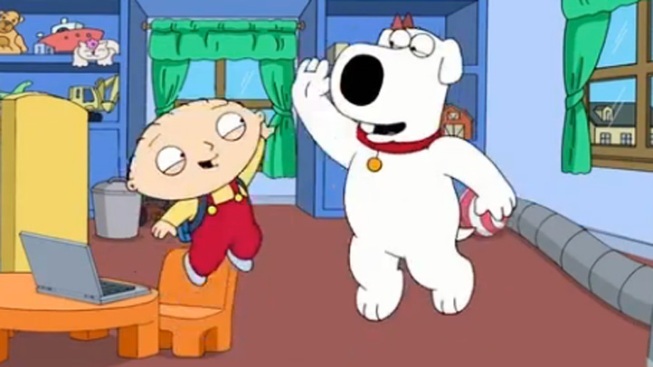 Stewie and Brian cheer after going back in time to ensure that 9/11 happened. Even a decade later, it's still too soon for 9/11 jokes. Sunday night's episode of "Family Guy" had cartoon stars Stewie and Brian exchanging high fives and taking credit for ensuring the attacks on the Twin Towers took place. The context: First the pair traveled back to prevent the terror attacks, but inadvertantly created a more dire future, one in which the nation was engaged in a decade-long civil war. The pair conclded that things would be better in 2011 if the attacks occurred than if they had not. So they go back in time to make sure history occurred the way it did. Entertainment Weekly noted the show has "joked about everything from the Holocaust to domestic abuse," but wondered if this was too much. Deadline Hollywood noted the episode "squeaked past the Fox standards and practices department but is sure to raise as many eyebrows."